The Atlassian Bamboo team is proud to release Bamboo 2.4. Hot on the heels of Bamboo 2.3, our latest release comes packed full of improvements to key Bamboo features. If you use JIRA 4.0, you'll be happy to know that Bamboo 2.4 is fully compatible with Atlassian's biggest ever JIRA release. You'll be able to take advantage of JIRA's dynamic dashboards with our new Bamboo gadgets, including revamped versions of our existing Bamboo portlets. We've also overhauled the Clover plugin that is bundled with Bamboo. If you use Atlassian's Clover, you will be able to view your Clover HTML reports in Bamboo or even view your Clover information in JIRA via a gadget. Getting Clover to work with Bamboo is also much simpler — integrate with a single-click. Finally, we've added a number of useful tools for Bamboo administrators and developers. The Bamboo REST API has been extended and now incorporates a host of new services, including services with POST methods. Bamboo administrators can also take advantage of our new runtime log4j configuration feature to configure logging levels for Bamboo classes on the fly. Upgrading to Bamboo 2.4 is free for all customers with active Bamboo software maintenance. You can download Bamboo from the Atlassian website. If upgrading from a previous version, please read the Bamboo 2.4 Upgrade Guide. Atlassian's JIRA 4.0 has a wealth of useful functionality and we've improved the Bamboo-JIRA integration in this release so you can take advantage of it. Our existing Bamboo portlets have been upgraded to gadgets for JIRA 4 and we've added some new gadgets too. You'll notice that the Bamboo gadgets not only look better than the old portlets, they also provide you with more information about your Bamboo instance. Read more about Integrating Bamboo with Jira applications. If you don't have JIRA 4 already, give it a try! 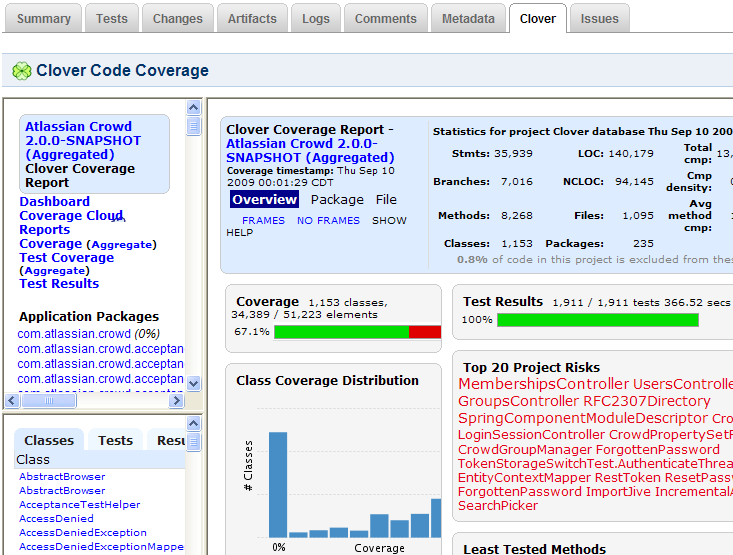 We have made a number of improvements to the Clover plugin for Bamboo in this release. You can now integrate Atlassian's Clover with Bamboo via a single click, access embedded HTML reports and view Clover information in the Bamboo gadget. Read more about configuring the Clover plugin for Bamboo. The REST interface for Bamboo has been extended for this release. You will now be able to access a range of new REST methods to help you access and update Bamboo information. Read more about the Bamboo REST APIs. We're a bundling a feature in Bamboo 2.4 that our own support staff have found incredibly helpful — runtime log4j configuration. This handy Bamboo administration tool allows you to temporarily adjust the logging levels defined in your log4j.properties file. You can change the logging levels on existing packages as well as add new packages to be monitored on the fly. 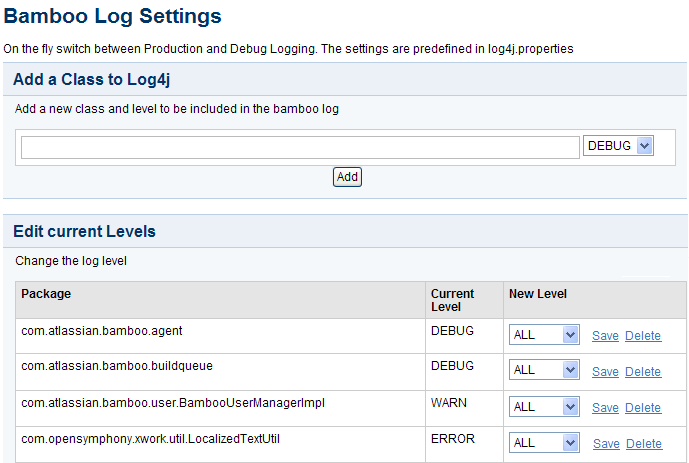 Read more about configuring logging in Bamboo.